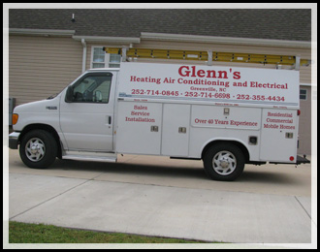 Glenn's Heating, Air Conditioning & Electrical, Inc.
We provide residential and commercial customers of the Greenville, North Carolina area with heating, air conditioning, electrical and ventilation services for remodeling projects, mobile homes, existing homes, or new construction homes and new commercial businesses. We are a locally family owned and operated business. We have over 47 years of experience. We ensure that your HVAC systems run efficiently. When performing at top efficiency, it will also save you money. Located on Charles Boulevard just before BlueBill Drive.